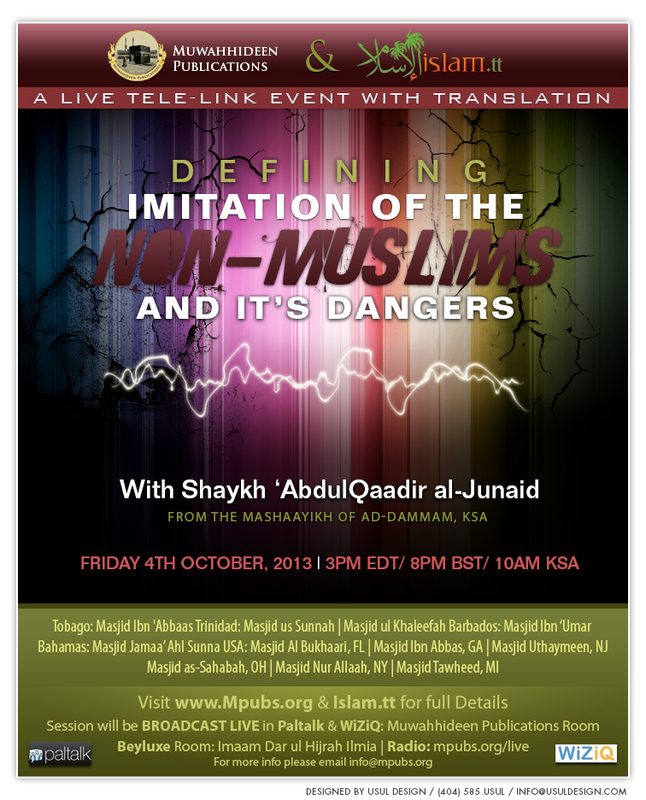 The Noble Shaykh 'Abdul Qaadir Ibn Muhammad al-Junaid (May Allah Preserve Him), from the scholars of Ad-Dammam, K.S.A., will deliver a LIVE tele-lecture with Muwahhideen Publications on Friday 4th October 2013. The Shaykh is recognized and recommended by the major scholars of our time, the likes of Shaykh 'Ubayd al-Jaabiree, Shaykh Muhammad Ibn Haadee al-Madkhalee, and many others (May Allah preserve them). This event will be broadcast LIVE in Masjid Ibn 'Abbaas, Tobago, two masaajid in Trinidad, Masjid ul Khaleefah and Masjid us Sunnah, and six Masaajid in the U.S. Masjid Al-Bukhaari, Florida, Masjid Ibn 'Abbas, Georgia, Masjid Uthaymeen, New Jersey, Masjid Nur Allaah, New York, Masjid as-Sahabah, Ohio and Masjid Tawheed, Michigan.